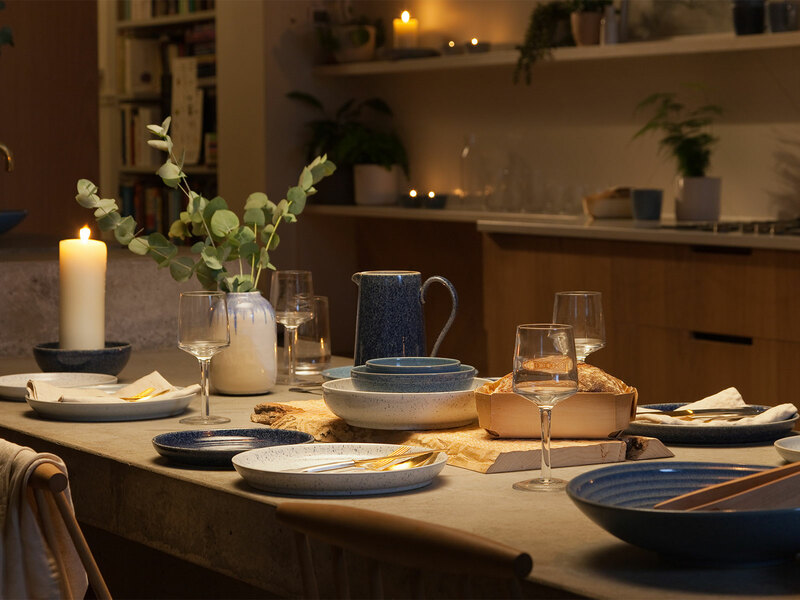 As we continue on our course of mindful living this year (time to look after ourselves as well as our work), we were asked by Denby Pottery, that well known family fav, to take a look at their new Studio Blue collection and see if we could style it for them. 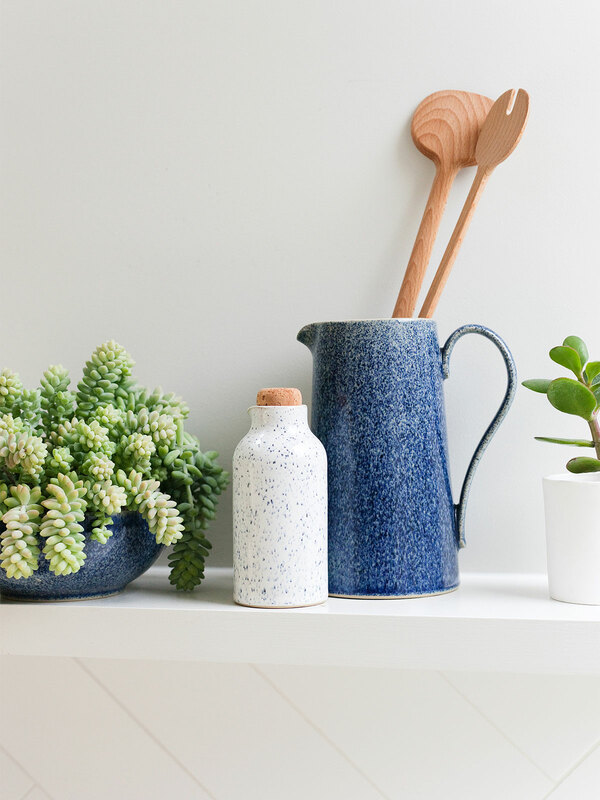 We have a small obsession with ceramics and blue is our go to favourite colour (when we aren’t going pink) so this was love at first sight for us. Each one is unique and the focus is on bowls, lots of them, big and small, in varying shades with a slight speckle on the surface. Delicious and so easy to love. 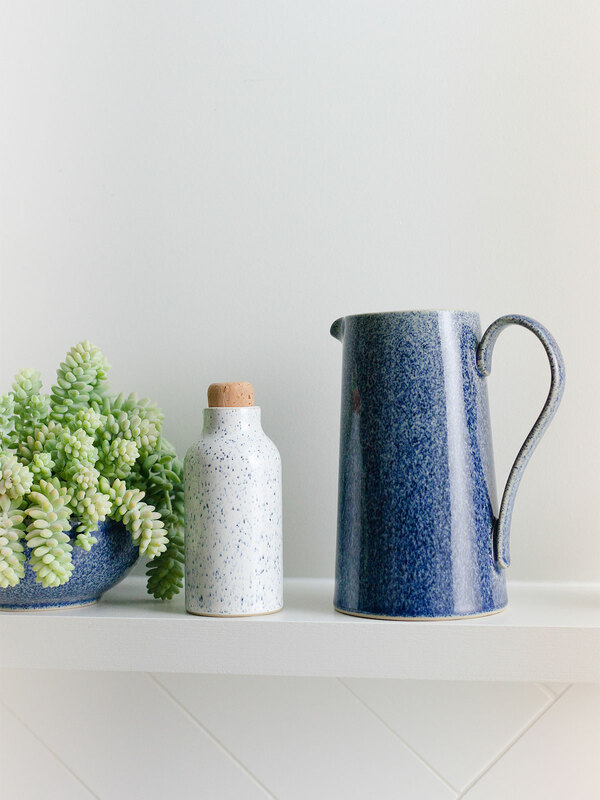 Someone once told us (I think it was our lovely ceramic artist friend, William Martin) that blue and white ceramics are the most sought after al over the world – hardly surprising since it is such an effortlessly classic combo. 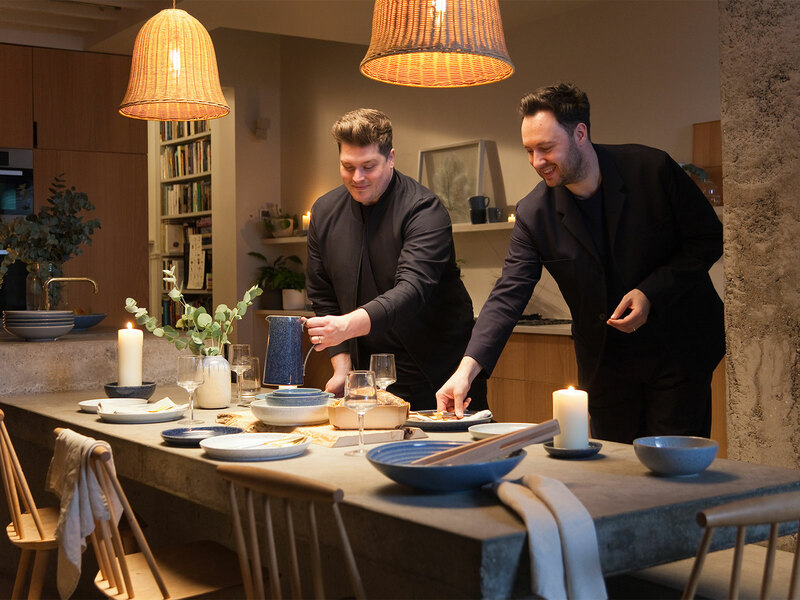 We have also found out, from the lovely Denby team, that apparently we are increasingly picking up bowls to have a relaxed hearty dining experience. Have to say, we are with them on that. We love to make a huge bowl of something delicious to share with friends and family. 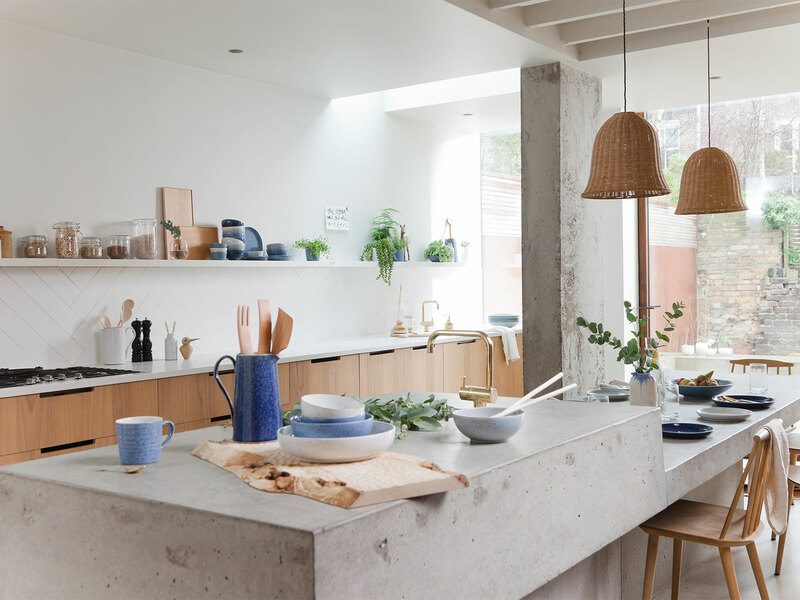 Plates still have a place with us (on Sundays mainly for some bizarre reason – a big cooked breakfast would be a little odd in a bowl) but bowls are an everyday go to for a home cooked lunch in the studio for sure. Here is our take on the Studio Blue collection for you to enjoy. 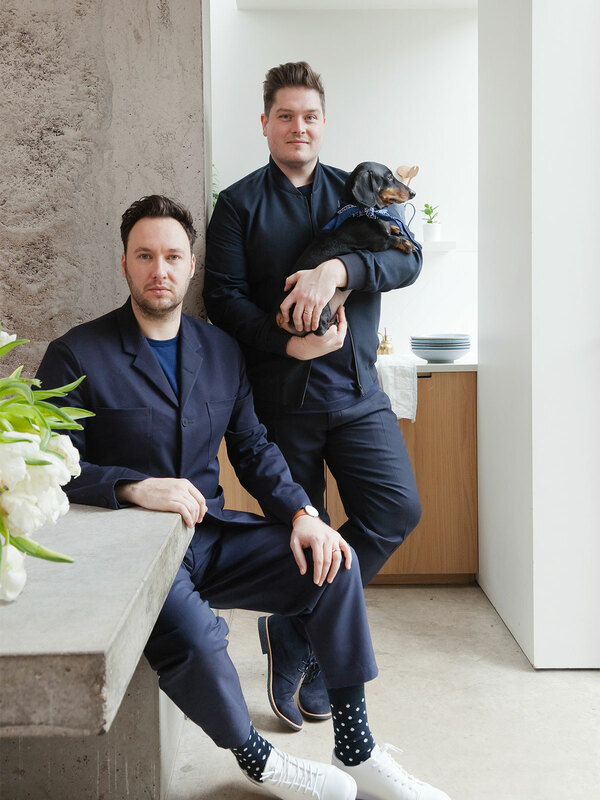 Along with plenty of tips on creating a mindful kitchen in your own home. 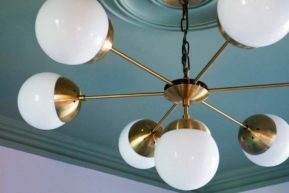 Craftsmanship is so important to the way we live now. We commissioned this solid ash board from local maker, Hishhoff and it is the perfect centrepiece to the kitchen table. 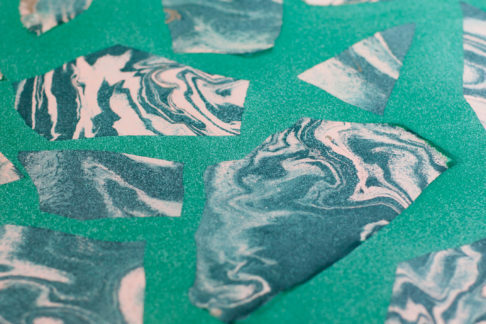 The rough texture sets off the blue ceramics beautifully. 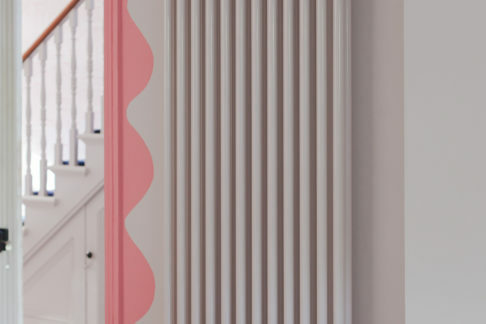 Calm colours to soothe the spirit – Blue hues can help a complex and busy world feel simpler. 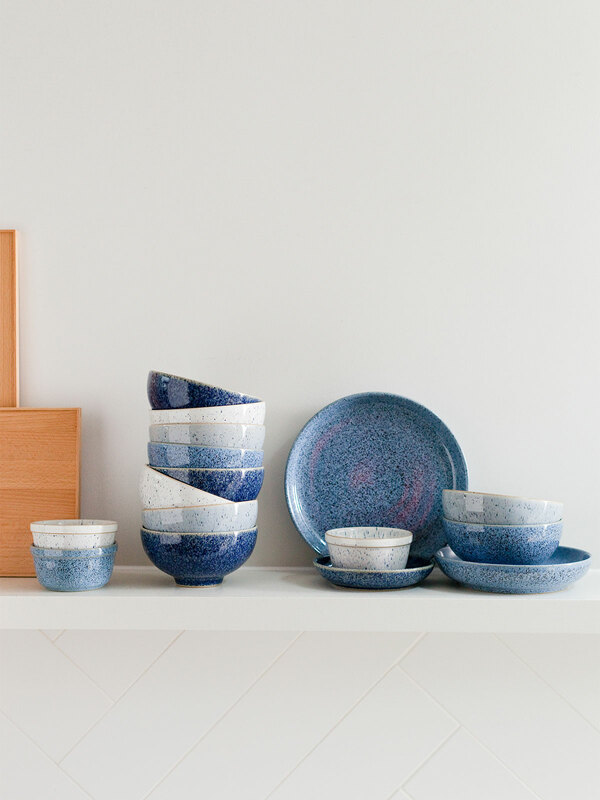 Pair blue ceramics with warm woods and natural linen for a palette that is both effortless and classic. 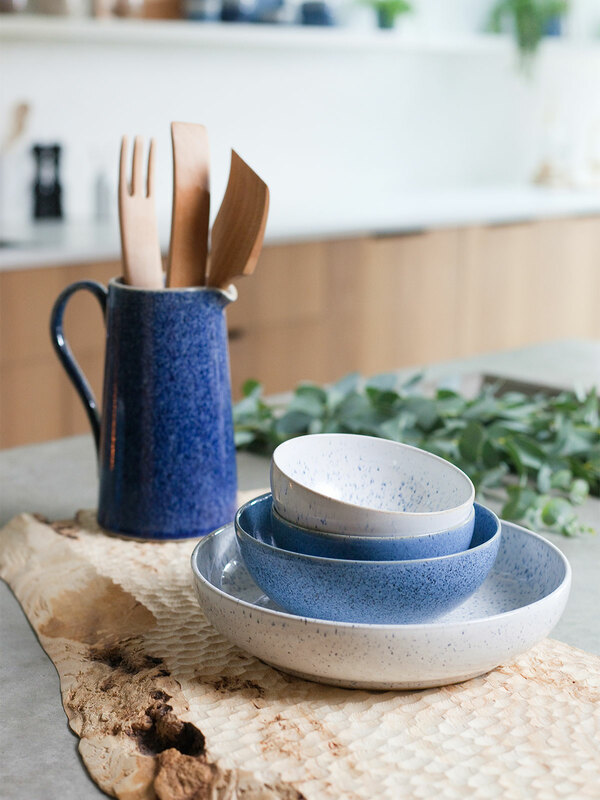 Stacks of Studio Blue bowls and plates, in four natural tones, are both calming and pleasing on the eye. 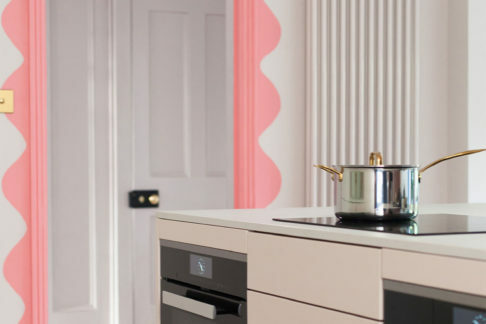 Socialising is good for the soul – Have friends round and let yourself enjoy the occasion with them – don’t get stuck in the kitchen. Create sharing dishes, you’ll get to enjoy the conversation and they’ll feel more at home by serving themselves. A large wooden board creates a wonderful centrepiece for relaxed dining, while bowl food is perfect for more informal entertaining occasions. Wicked wicker – lights like these are having a real moment and they create such a soft diffused light with the main light directed down at the table - great for dining. 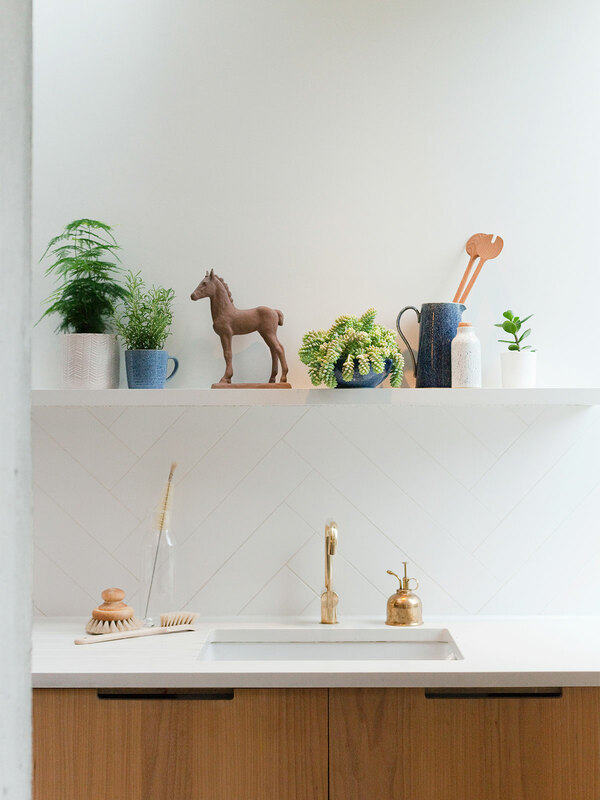 Everything in its place – Make room for things to be put away and leave open shelves free to house only the most loved objects. 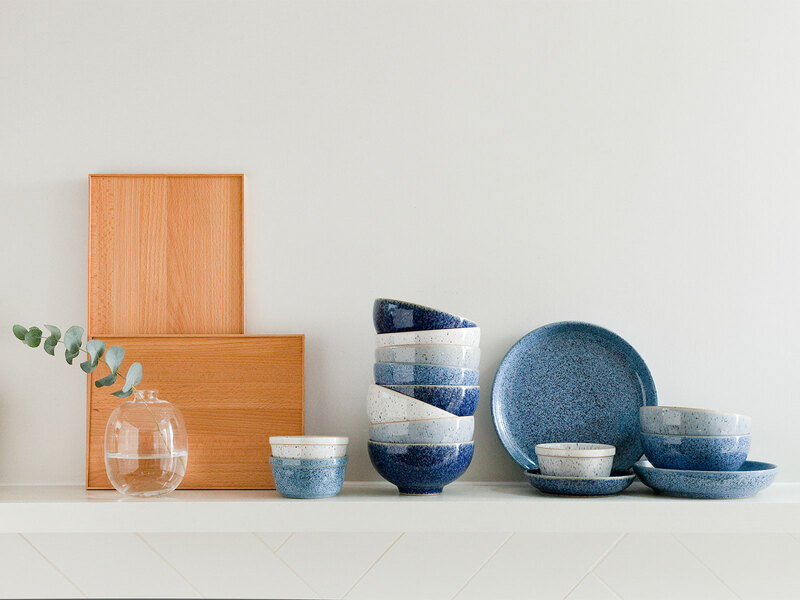 Having the things you need to hand can help you create a mindful display that is both functional and beautiful. Jars of healthy pulses and wholegrains next to stacks of hand-crafted ceramics also remind you to look after yourself and your body. 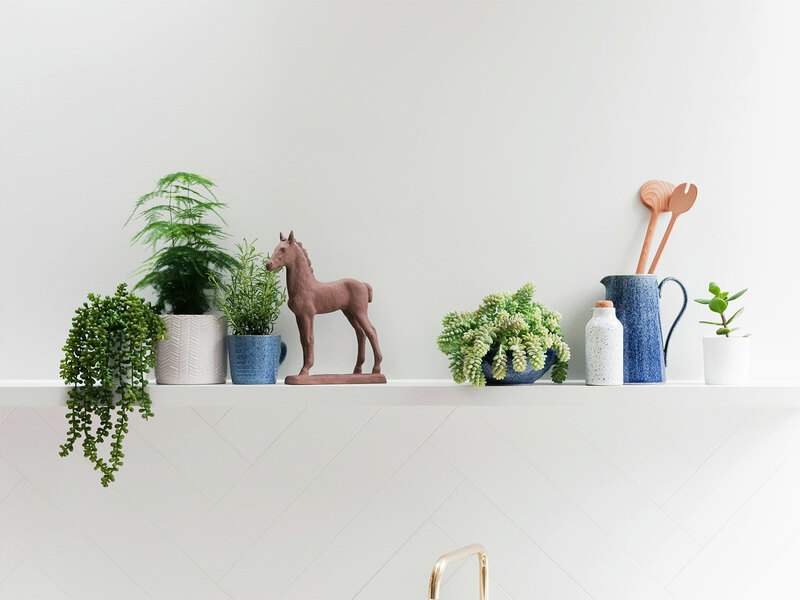 Go green – Plants purify air in the home while offering the opportunity to take your mind off yourself for a moment as you water and care for them. Use bowls and mugs to plant succulents and ferns, giving a coherence to the kitchen as a whole. You can even use a jug for watering and let it live next to the plants for ease. 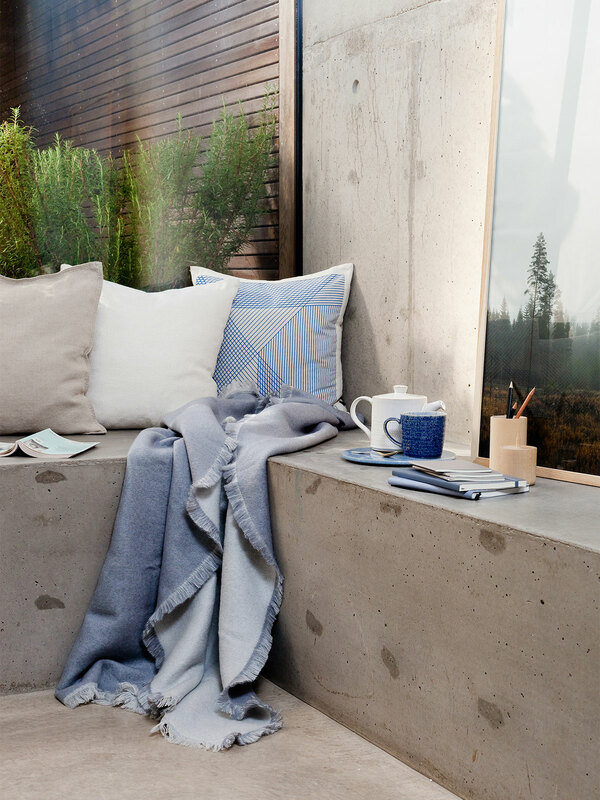 Creating a space in the home for mindful moments, with soft cushions and throws made from natural fibres, makes it easier to remember to allow that restful time. 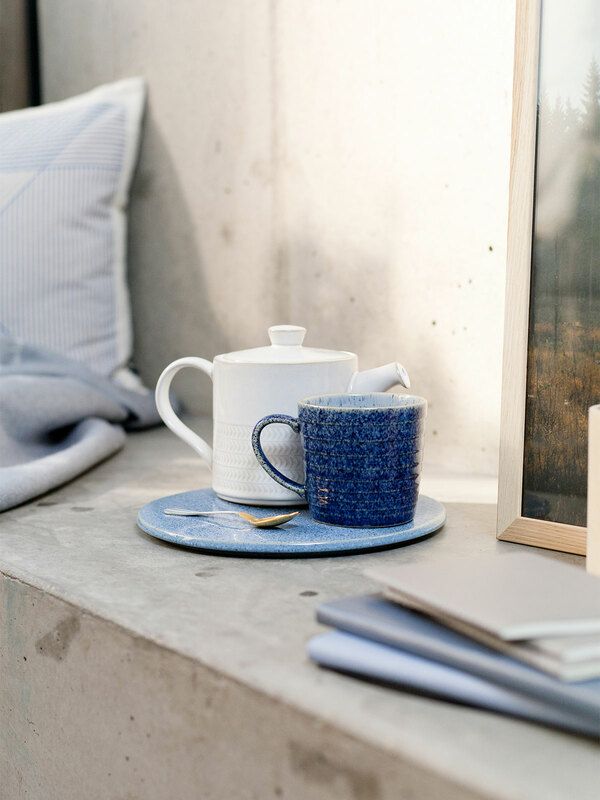 Space for mindful moments - A nook by the window also connects you to the outdoors as you sip your warming green tea from your favourite mug. 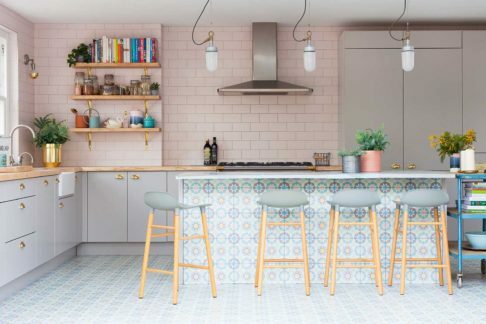 We almost couldn’t bear to leave this space once we had finished, but it is only giving us even more energy to get on with our kitchen renovation – more on that soon. 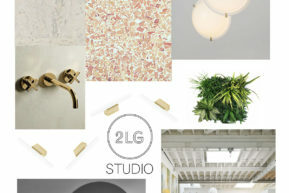 Here is a little youtube video of the space to get you into the mood for a dinner party.